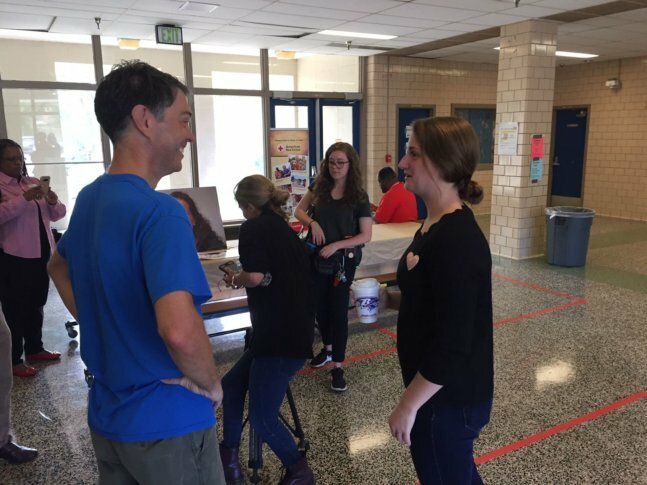 A Red Cross blood drive at Bates Middle School in Annapolis was held in honor of Wendi Winters, a Capital Gazette reporter killed in the newsroom shooting earlier this year who spent a lot of time volunteering at various blood drives. WASHINGTON — There were big goals centered on a blood drive being held for someone with a big heart. A blood drive being held Saturday at Bates Middle School in Annapolis already had 170 people signed up to give, with more walk-ins expected — an enormous turnout compared to the far smaller crowds that these events typically draw. It’s reflective of the spirit of Wendi Winters, a Capital Gazette reporter killed in the newsroom shooting earlier this year, and someone who spent so much time helping the Red Cross with previous blood drives. Salemme says Saturday’s event became even more important because so many other blood drives in the mid-Atlantic region were canceled because of the hurricane in the Carolinas. Geimer said a “good day” at the blood drives her mother used to work would only see about 40 donors. Sometimes Winters herself would be one of those donors. Among the first people in line to donate this morning were Jenna and Karen Gipple of Arnold, Maryland, a mother and daughter who knew Winters. “Jenna went to school, was in scouts with her daughter” said Karen. This was Jenna’s first time donating blood.